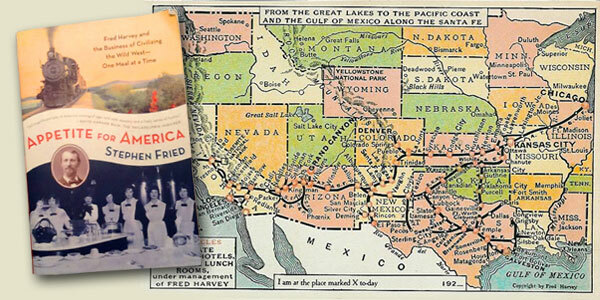 Reading Material: “Appetite for America” tells the Fred Harvey story. On any trip across the Southwest, you’re likely to encounter the shadow of the Fred Harvey Corporation, one of the greatest American companies of the late 19th and early 20th centuries. Its founder, Fred Harvey, was an English immigrant who arrived in New York City in 1853 at a time when the modern restaurant and hospitality industries did not yet exist and eating in public was even considered unsophisticated (I would have starved). He made his way to the new railroad town of Leavenworth, Kansas and became a business pioneer who started the company that opened America’s first restaurant chain and was instrumental in promoting tourism in the Southwest. Appetite for America, by Stephen Fried, chronicles the man, his family and the company they ran for 90 years through three generations. Fred got his start working in restaurants and retail in New York, New Orleans and St. Louis. Later, while frequently traveling as an advertising salesman for railroad companies, he saw an opportunity for quality food in the new frontier west of the Missouri River. After successfully managing his first trackside “eating house,” he proposed a deal with the rapidly expanding Atchison, Topeka and Santa Fe railroad to run the restaurants alongside the entire rail line, creating the first chain of restaurants, known as Harvey Houses. Back then, trains had to stop about every 100 miles to refill with water, so passengers got off to eat at those stops. It turned out to be a turning point not only for railroad dining, but for American cuisine, with quality ingredients, service and attention to detail being brought into a free-wheeling country. He even lured a famous chef from Chicago’s Palmer House Hotel to create meals in a kitchen in the middle of Kansas. The business expanded along with the railroad and quickly turned into a hospitality empire, adding hotels, news stands and gift shops to the mix. One of the most iconic traits of Fred Harvey was their employment of women. At a time when few worked, they hired thousands of young, educated women as wait staff, and thus are given partial credit for civilizing the West, not to mention instigating many Wild West weddings. These women were known as Harvey Girls. 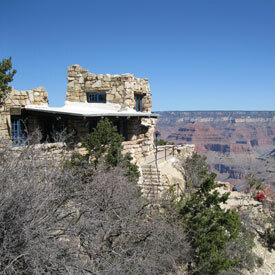 Mary Colter’s consciously crumbled Lookout Studio at the Grand Canyon’s south rim. After the turn of the century the Harvey family became increasingly interested in the culture and history of the Southwest and used it to lure travelers to the then exotic region. The company curated Native American art and artifacts, led “Indian Detours” excursions to native villages and hired an architect named Mary Colter to design stylish, signature Southwest-inspired restaurant and hotel buildings. They were also a huge proponent of preserving the Grand Canyon as a national park, as its future was not secure until 1919. At its height, Fred Harvey stretched from Los Angeles to Cleveland, managing food and retail operations at entire union stations in major cities in between. Sadly, after the 1930s, the company’s fortunes dwindled along with declining train ridership and increased competition from new roadside burger chains. Today only remnants are left of the former Fred Harvey empire, most notably in the form of Xanterra Resorts, a hospitality company that manages several National Park lodging operations (but doesn’t exactly match the Harvey standards of the heyday). On a brighter note, much of the famous Mary Colter architecture is still intact. While some of the hotels along the old Santa Fe rail line have been torn down, others have recently been restored as more people take notice of the history and nostalgia of the Fred Harvey Company. Interestingly, you can still travel the route of the old Santa Fe line from Chicago to Los Angeles. It is now a 43-hour Amtrak route called the Southwest Chief and leaves Union Station every afternoon. Probably the best place to see the legacy of Fred Harvey is at the south rim of the Grand Canyon. Bright Angel Lodge, Hopi House, Desert View Watchtower, Phantom Ranch, Hermit’s Rest and the Luxurious El Tovar were all built by the company and still welcome millions of National Park visitors every year. Just off the Bright Angel Lodge’s lobby is a room dedicated to the history of the company, including mannequins dressed in the famous Harvey Girl attire. If you have been to or have plans to visit Grand Canyon National Park or anywhere along the Santa Fe route, Appetite for America is especially interesting, as it ties together a lot of historical information from the period and the region. Fred Harvey food, service and china pattern live on at El Tovar lodge. Mary Colter’s Bright Angel Lodge lobby. This entry was posted in Travel Resources and tagged Fred Harvey, Grand Canyon, Harvey Girls, Harvey House, Mary Colter, Road trip, Santa Fe Railroad, Southwest Chief. Bookmark the permalink. 2 Responses to Reading Material: “Appetite for America” tells the Fred Harvey story.